Sometimes it can be good to have a horse in professional training for a period. The starting of a horse can be a reason, or to give a rehabilitation process a push. For regular students I do offer a short stay, e.g. for your vacation. 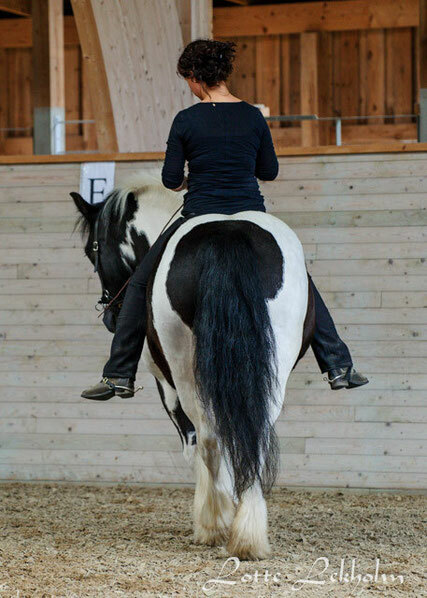 Due to its focus on biomechanics, the art of riding can help to develop all kinds of horses. During the last years I specialised on rehabilitation training of horses that due to illness or former career (e.g. as a trotter), or a special character are in need of a special care. The training is not depending on a breed, it is meant for the horse you love and need support with. In particular harmed horses of both, physical or psychological, a longer period of professional training has to be considered, and clear goals for future healthy body should be made. Additionally to the art of riding, I have studied equine osteopathy & energetic work. This way, I get an even deeper insight into the equine body and metabolism than the art of riding is already providing. You are welcome to ask for a free place.